I was hoping to get some advice and suggestions on a trip I'll be taking in July. I have a conference in Graz (Austria) that ends on July 2nd. At that point I'll take a train back to Vienna to meet my girlfriend who will be arriving from our home in Winnipeg (Canada). We've both been to Europe only once, and that was a short trip with most of our time spent in France. We both share a love for the outdoors and great scenery, so we are hoping to incorporate a few day hikes into the trip. And I've got to ask the very common question I see on the boards: Train or car? I'm not especially concerned about cost comparisons, but it's July so I'm not sure how congested the roads will be. The plan would be to rent a car as I leave Vienna and arrive in Munich. I would really love to drive the Glossglockner road and I'm not sure how easy it would be to just rent one for the day. I'd love to go hike around Lake Oeschinen (Switzerland), but I don't know how I'd do that travelling by train. My initial plan is somewhat based on train routes. I'd consider avoiding Zurich (after seeing hotel prices) and maybe heading into the Black Forest area of Germany (e.g. Baden-Baden), but by train I think I need to go through Zurich. I'd love to hear from someone who has travelled the area in July/August to tell me if renting a car is a bad idea. The only thing I've booked is my initial flight into Graz and departure from Munich. I'm wide open to any suggestions or thoughts you might have on this trip. Should I be travelling all the way to Zermatt or is my time better spent in the Austrian Alps? Thoughts on replacing Lucerne with Interlaken? Thank you in advance! Lucerne and Interlaken are both transport hubs for travels into the Swiss Alps. If you stay in Tyrol, visit the very interesting towns of Bolzano/Bozen and Innsbruck instead. Or head to the south to charming Lake Garda. I think this is the kind of trip that makes sense for a car (except perhaps for Zurich) because it gives you easy and immediate access to the countryside and many of the smaller towns on your list or between those towns. We have done MANY road trips in europe and found the drop off charge a minor cost compared to that of the whole trip - and worth it for the conveninece and opportunities for serendipity. Persoannly if you've never been to Switzerland I'd substitute the final days in Zurich, a nice but big modern city that seems to excite relatively few and put them into the fantastic Jungfrau Region around Interlaken - even more than Zermatt this will fulfill the romantic dreamy glacier-girdled Alpine wonderland picture of Switzerland perhaps etched in your minds' eyes. Spent 2 weeks a few years ago in Kandersteg, visited Oeschinensee and hiked thereabouts. Used train for entirety. Well-signed hike from area of chairlift up to the beautiful mountain lake OR take the spectacular chairlift UP and hike back down. Simple to reach by train. I would skip both Zermatt and Zurich ans include the best of the Swiss alps in the Berner Oberland, staying at Wengen or Grindelwald. Also, Salzburg is much nicer than Innsbruck. I take it that you really have the 3rd through the 19th available. That's 17 days. I suggest for initial planning you use a formula of 4 nights per stop. You need to take into account that every time you move you lose most of a day to travel. So to get 3 full days in a place you need to plan on 4 nights per place. Doing that gives you maximum time IN places rather than in BETWEEN places. If you use that formula you should not plan on staying in more than 4 places! That includes Vienna and Munich. Compare that to your current list which will see you moving 6 times. I would also suggest you stay in smaller towns/villages rather than cities if as you say you have a love for the outdoors and great scenery. For example, in Switzerland I would not stay in Zurich, Zermatt or Lucerne. Instead I would stay in somewhere like Wengen or Grindelwald (suggested by bobthenavigator). You can day trip to a city if you really feel it is somewhere you want to go rather than simply somewhere you have heard of. So for example, assuming you have reasons for wanting to visit Vienna I would stay there 4 nights and then move on to Salzburg for 4-5 nights; then Wengen/Grindelwald for 4-5 nights and finally Munich(again assuming you have reasons for wanting to spend time in Munich) for the last 4 nights. In both Salzburg and Wengen/Grindelwald you would do day trips to hike or visit somewhere like Bern or Lucerne for a day. Taking Wengen/Grindelwald for example it might look like this. Arrive, check-in, look around town, have a nice dinner. First full day, hike to Faulhorn and return. Day 2, visit Ballenberg which is a unique experience. It's like visiting various regions of Switzerland and seeing the differences in architecture for each as well as observing and taking part in traditional farm and craft activities, all in one day. On day 3, hop the train and day trip to Lucerne or Bern. In travel as in many things, less is more. Move less, see andn do more. nytraveler, the main reservation I have about renting a car stems from the image in my head of being stuck in bumper to bumber traffic and seeing the train whizzing by towards the same destination! With a car, I would consider skipping Zurich or maybe just drop the car there. PalenQ, your description is exactly what I'm dreaming about! I was initially planning on taking the Glacier express from St. Moritz to Zermatt, just because I'd heard it's a scenic ride...but it sounds like the whole area is scenic so there's no point taking an 8 hour train ride. I was kinda excited about this hotel, "3100 Kulmhotel Gornergrat", as it seems like a fun experience, but maybe it's not worth heading all the way to Zermatt for that. mokka4, thanks for the recommendation! I stumbled across a picture of the lake on reddit and can't imagine a more beautiful scene. bobthenavigator, Wengen looks beautiful! I'd investigate a little further. Zurich I might avoid. I was a bit concerned that my whole trip will be all countryside and I know my girlfriend will want a bit more metropolitan culture and history on the trip, so I thought throwing in Zurich and Munich at the end might be wise. Zurich was also just a convenient stop on my way back to Munich. And I wasn't sure about Salzburg only because I've never seen Sound of Music! Thanks for the advice! dulciusexasperis, I was expecting someone to comment on the short stops I planned a little sooner! I'm glad you did. I started thinking after my initial plan that stopping to have only one full day in Zell am See means that we would do a hike and that's all we really see of the area before moving on. Probably could use our limited time in a better way. I guess I just didn't want to spend more than a few hours on the train (or driving) at a time, but I think your formula makes sense. Vienna and Munich are our points of arrival and departure, so I'm happy to spend some time there and get a feel for the cities. The two other destinations, then, I'm thinking Jungfrau region and Tyrol. So what do you think about train versus car for such a trip? And regarding Salzburg, as I sort of suggested above, reading the descriptions of things to do there didn't really catch my attention. Some descriptions make it sound very touristy (but I guess I'll be a tourist so what can I expect). Thanks for your help! The question of car vs. train is a difficult one. The car gives ultimate flexibility but in these countries, the trains go just about anywhere you would want to go and the buses go where the trains don't. A Swiss rail pass not only gets you the trains and the buses but cover many of the cable cars etc. as well for at least a discount. I've done both ways and enjoyed both ways. One advantage to the train for example is that the driver does not need to keep his/her eyes on the road. I think I would lean to the train simply because there could be a lot of days when the car was just not being used at all. Also, for us N. Americans, the train is a bit of an adventure, the car is not. I've spent a total of around a year in Switzerland in trips of a week to a month in duration. I'm not nearly as familiar with Austria and would leave that to others to help with ideas. I just use Salzburg as an example above of fewer stops. Regarding the Sound of Music. Although the story takes place in Austria, it could as easily be set in Switzerland in terms of the 'sound' of music. Thank you, dulciusexasperis. Your advice has very much appreciated. I was honestly about to book some hotels a few days ago and now I've totally overhauled my plans! 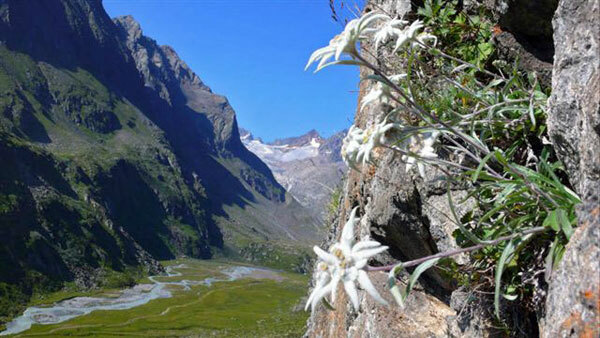 Yup Edelweiss everywhere in Swiss Alps - the song reverberates thru my head when I' m hiking often. Edelweiss has been responsible for many deaths PalenQ. Because of the difficulty of picking one at high altitude, it took on a symbolic meaning to wear one in your hat. As a result, people trying to get to one have fallen and died. They are now a protected species in much of Europe and picking one today will get you in serious trouble. My wife has some growing in our garden here in Canada. That looks like a good plan to me. Zermatt with the view of the Matterhorn is exceptional. Personally I would eliminate Innsbruck and spend the days between Zell and Lucerne visiting 3 different villages along the way and would eliminate a day in Zurich to stay somewhere in Germany on the way to Munich. These last two ideas I would do especially if I was driving. I would not eliminate Innsbruck. We stayed there (actually just outside it) for just one nite and really liked it. I'd vote for a car. I too enjoyed Innsbruck the several times I have stayed there - take the mountain tram to the former Winter Olympics ski jump area and a sylvan area of forests and hiking paths and hills - stop at the Schloss Ambras on the way - Innsbruck to me is a really nice city itself but often maligned it seems - I can't figure out why? Whenever someone mentions Zermatt I always recall one time that I was there and after a long day of hiking, I was sitting at the bar in my hotel enjoying a cold drink. The bar had a huge panoramic window looking out towards the Matterhorn. This is a true story. I won't say what country the woman was from. Tourists really do say the funniest things. Well it were obviously an American tourist!